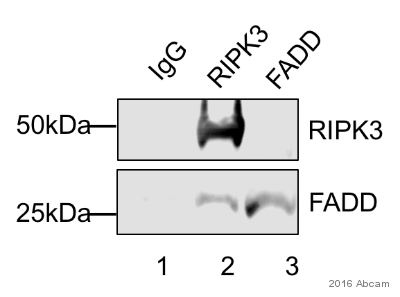 Synthetic peptide corresponding to residues in the C-terminus of Mouse FADD. Mouse kidney tissue; Mouse spleen lysate, Raw264.7 cell lysate and NIH/3T3 cell lysate. Human, Rat: We have preliminary internal testing data to indicate this antibody may not react with these species. Please contact us for more information. Our Abpromise guarantee covers the use of ab124812 in the following tested applications. WB 1/1000 - 1/10000. 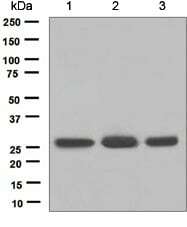 Detects a band of approximately 28 kDa (predicted molecular weight: 23 kDa). Is unsuitable for ICC or IP. Apoptotic adaptor molecule that recruits caspase-8 or caspase-10 to the activated Fas (CD95) or TNFR-1 receptors. The resulting aggregate called the death-inducing signaling complex (DISC) performs caspase-8 proteolytic activation. Active caspase-8 initiates the subsequent cascade of caspases mediating apoptosis. Contains 1 DED (death effector) domain. Contains a death domain involved in the binding of the corresponding domain within Fas receptor. 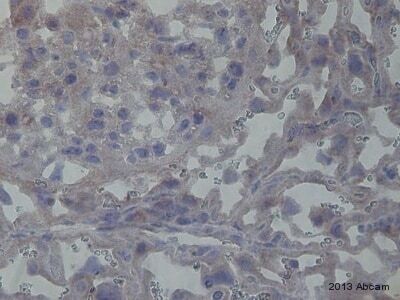 ab124812, at 1/50 dilution, staining FADD in paraffin-embedded Mouse Kidney tissue by Immunohistochemistry. Publishing research using ab124812? Please let us know so that we can cite the reference in this datasheet.